“In a distinguished career spanning six decades, Leonard Shure appeared as a soloist with nearly every major American orchestra and taught at many prominent music conservatories, including the Mannes College of Music in Manhattan, the Cleveland Institute of Music and the New England Conservatory in Boston. Among his students in piano and chamber music were Jerome Rose, Ursula Oppens, Gilbert Kalish, David del Tredici and Pinchas Zukerman. Mr. Shure was born in Los Angeles in 1910. A child prodigy, he began performing in public at an early age. At 15, he went to Berlin to study with Artur Schnabel, and after graduating from the Hochschule fur Musik he stayed in Germany as Schnabel's first and only teaching assistant. He made his official American début in 1934 playing the Brahms d-minor Concerto with the Boston Symphony Orchestra under Serge Koussevitzky. After hearing a repeat performance at Carnegie Hall, Olin Downes, writing in THE NEW YORK TIMES, called Mr. Shure ‘a pianist with exceptional gifts�. 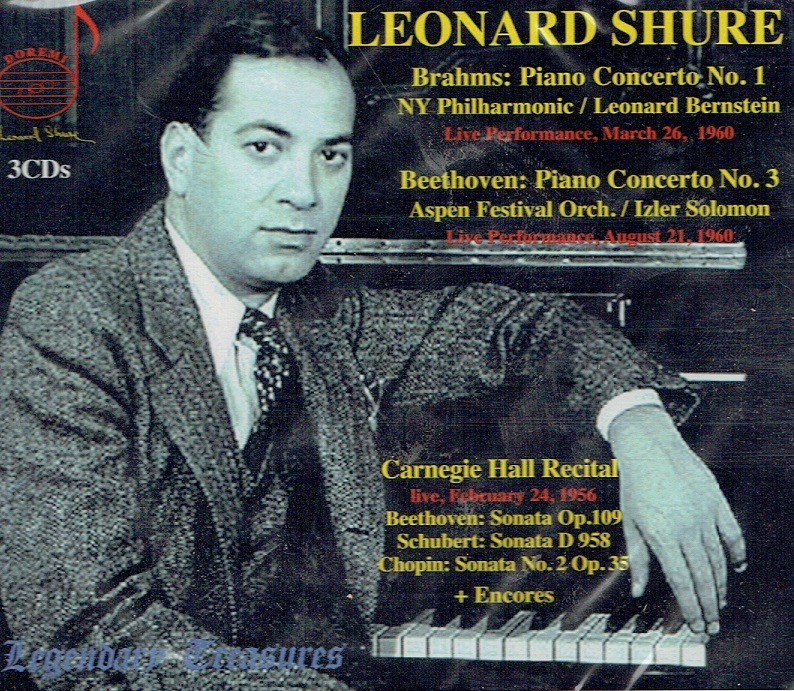 "Leonard Shure (1910-1995), an Artur Schnabel student, was one of the most respected American pianists and pedagogues of the 20th century. This new release presents live performances, including his 1960 collaboration with Leonard Bernstein and the New York Philharmonic on the Brahms' first piano concerto. 'Shure played with a thrilling blend of insight, breadth, authority and daring', wrote THE NEW YORK TIMES. 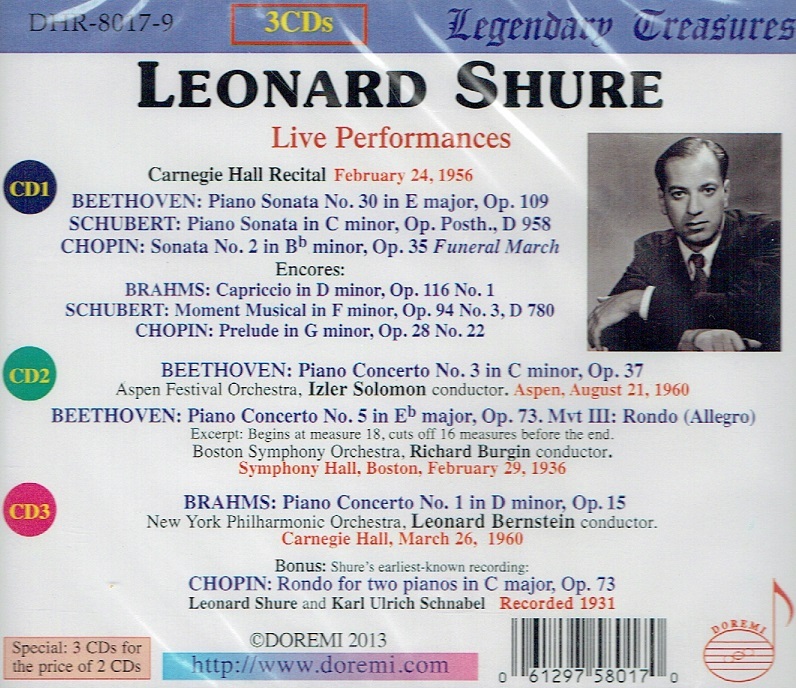 Also included is his Carnegie Hall Recital from February 1956, which features his Encores, and his Symphony Hall Boston concert from February 1936. This is the first release of each of these recordings."